I have been a wedding minister in Los Angeles for many years and I have performed many civil wedding ceremonies and religious wedding ceremonies in many Simi Valley Wedding Locations. Some have been at Best Western Posada Royale Hotel & Suites. The Best Western Posada Royale Hotel & Suites caters to your every need. They will help host your event in one of their five wedding venues. 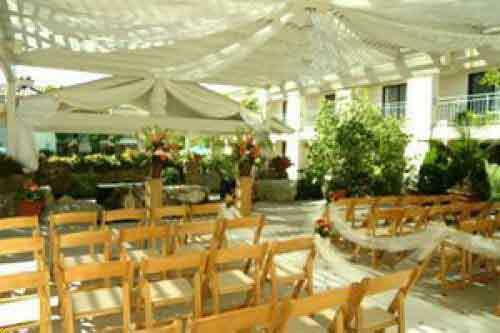 The Long Canyon, Sycamore Canyon and Club Royale are ideal for smaller functions such as bridal showers or luncheons. The Outdoor Courtyard provides a romantic ambiance with its dazzling waterfall for your wedding ceremony while the Posada Royale Ballroom, divisible into two sections, is perfect for a truly memorable wedding reception. Whether you are planning a 15-person bridal shower or 200-person wedding reception, their Catering Department will attend to your guests’ needs. Their Executive Chef and his team will delight their taste buds with the best wedding catering! If you are thinking of having your wedding ceremony or reception at Best Western Posada Royale Hotel & Suites or anywhere in Los Angeles County or Orange County California then consider having the Officiant Guy be your wedding officiant.